Andy Couturier loves teaching writing. Twenty years ago he entered a graduate program focused primarily on the teaching of writing at San Francisco State University. While MFA programs in Creative Writing are fine, they don’t often focus on how people learn to write. 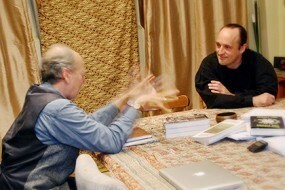 Andy consulting with climate scientist and depth psychologist Jeff Kiehl. Jeff just got an offer to publish his finished book with Columbia University Press. In his two-year MA program, his research emphasized bringing creativity to the revising process, how to organize long pieces of writing in innovative ways, and how to bring pleasure to the writing process where so many people suffer. 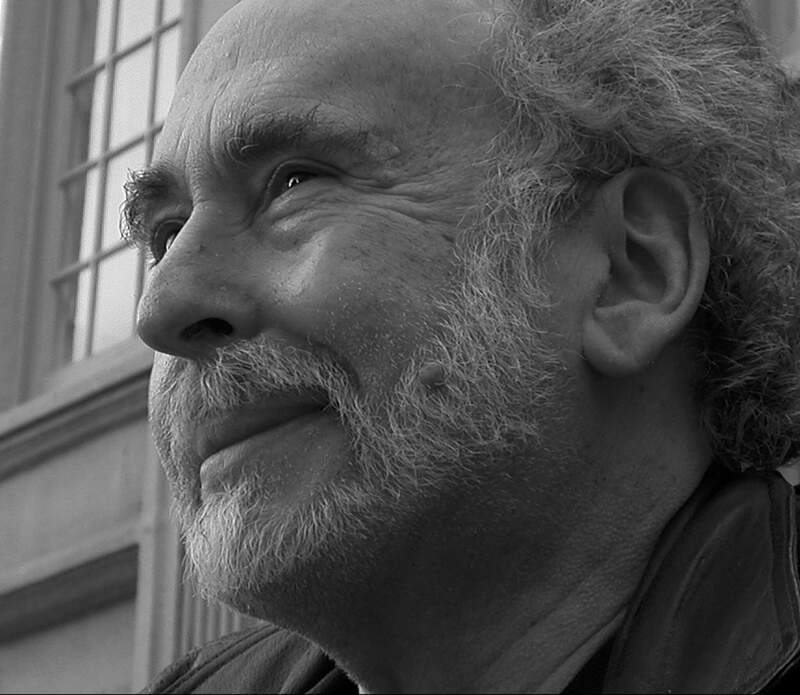 He is an active and widely published author with more than forty publishing credits to his name, including the Pushcart Prize-nominated essay, “Selling Indulgence in Corporate Japan”, and two full-length books, Writing Open the Mind and A Different Kind of Luxury, now going into its fourth printing. Graduates of the annual Teacher Training 6-Month Certificate Program, 2012. He recently completed his third book, Much, and has launched into his a fourth, an ecological adventure novel. In addition to directing The Opening for 18 years, Andy has taught writing in such far-flung environments as a botanical research station in the hills of Sri Lanka, a Silicon Valley corporation, SF MOMA, the Institute of Transpersonal Psychotherapy and the inner city classrooms of San Francisco. Andy lecturing at the Commonwealth Club of California. More formal instructional settings include JFK University, Cal State University East Bay, and at UC Santa Cruz. He also offers a Teacher Training Certificate Program through The Opening. Andy has lectured internationally at more than 40 locations, including the Commonwealth Club of California, Powell’s Books, and Book Passages. Andy’s varied publications include MIT Press, Adbusters, The Japan Times, The Oakland Tribune, Creative Nonfiction Magazine, The North American Review, and Fiber Arts Magazine. “Writing Open the Mind is by far the most interesting and provocative book on the creative process I’ve read in many years.” – Peter S. Beagle, author of The Last Unicorn. 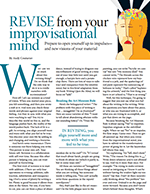 “If ‘writing exercises’ gives you a ho-hum callisthenic feeling–well, think again. What Writing Open the Mind offers is jumper-cable creativity, quirky gorgeousness, and nothing short of a world view: Life is for living.” – Catherine Newman, Author of Waiting for Birdy. Use the techniques in this book to jump-start your creativity, learn new tricks and expand your writing repertoire. This rollicking guide opens dozens of gateways to the subconscious world. Whether you are writing for publication or for personal pleasure, the practical tools and liberating philosophy found in this book will release the genius of the intuitive mind. Raised in the tumult of Japan’s industrial powerhouse, the eleven men and women profiled in this book have all made the transition to sustainable, fulfilling lives. They are today artists, philosophers, and farmers who reside deep in the mountains of rural Japan. Their lives may be simple, yet they are surrounded by the luxuries of nature, art, contemplation, delicious food, and an abundance of time. By presenting the journeys of these ordinary—yet exceptional—people, Andy Couturier shows how we too can travel a meaningful path of living simply, with respect for our communities and our natural resources. In Andy’s personal life, he enjoys doing hand work such as tree-planting, splitting firewood, home scale gardening and food production. He and his partner built a house with hand tools in the mountains. He loves to spend mornings reading classical Chinese poetry, or twentieth-century experimental, imagist and nature poetry. Ready to study with Andy? 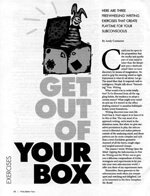 “Powerful writing comes naturally when your mind is energized and experimental, when it can take risks and follow the unexpected wherever it leads. Forty-five rollicking writing exercises to liberate your writing process.” Use the techniques in this book to jump-start your creativity, learn new tricks and expand your writing repertoire.